I'm SO glad it's not disappearing. I will be staying subscribed so I don't have to do anything but if you'd like to cancel made sure you do so by June 15th. 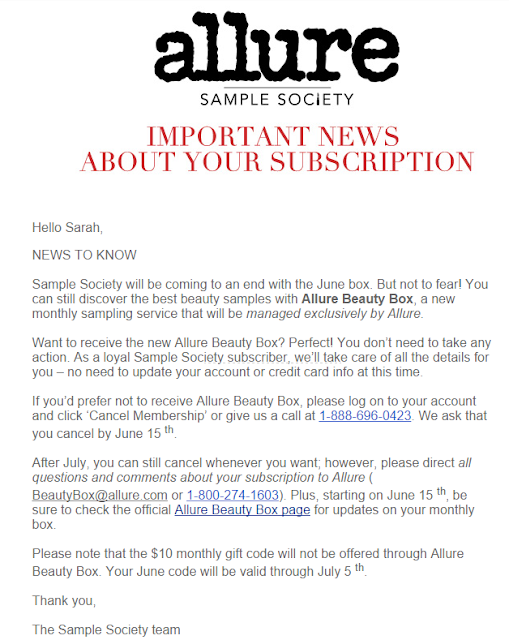 After June 15th, you will be able to access the new page: http://www.allure.com/beauty-products/beauty-box. Currently, it's an error message but they'll fix that. Also, they will be doing away with the $10 off coupon to BeautyBar. That makes sense and I never used it anyway so it doesn't bother me. What do you think? Is anyone else as relieved as I am that this subscription is not being closed?! I'm happy they are continuing the program. I thought the Allure change last year was halfway done. The CS people never did know what was going on after that LOL. I do need to add a caveat to my happiness- I will be happy IF the subscription keeps on sending high quality specialty brands with large samples that last a while with occasional full sized products. I will NOT be happy if Allure starts stocking the boxes with the same crappy brands they sell in their big Allure boxes every season. If I want that stuff, I can go to the drugstore and buy it, but I don't want it, so I don't buy it. Sarah, what is your impression regarding the sourced brands in the future vs. the past? In the past, Beauty Bar wanted our dollars for the full sized items and gave a small discount for them. I see that Allure is nixing that perk. I do worry a bit about getting Revlon, Aussie hair stuff and other drugstore brand foil samples now. Or those little travel samples that are in the $1,00 bins at Wal- Mart and similar stores. Ah, yes! You reminded me of what I was previously worried about. I also DO NOT want anything even remotely related to their boxes that come out 4 times a year! However because this box is curated by Allure editors, I think we will continue to see the same types of products that we have been accustomed to. I don't mind certain drugstore items every once in awhile. You can get the L'Oreal Colour Riche at Walgreens and I *love* that stuff. I have four colors now. I discovered that in Sample Society. BUT if it becomes only drugstore stuff or foil samples or lots of Suave shampoo or something, then no. I will cancel. I don't think that will happen, though. The Sample Society boxes serve a specific niche and I don't think they'll step out of it any time soon. Yep. I never got one because even though it's a good deal, you have to want to use what's in the box. And I've never wanted to use enough of it to even come close to justifying the expense. I am curious about how they plan to manage the subscription, though. And all the CS that goes with it. The one thing I do have to say about BeautyBar is that their customer service was FANTASTIC. But yeah... drugstore garbage is going to defeat the whole purpose of the box. The whole reason I loved it so much was for the brands. Well, for what it's worth, I called the number that was in our emails. I got some male CS person. I asked just what we are wondering- will the premium brand products that Beauty Bar stocked in the boxes still be featured when Allure takes over the curation. He asked about 100 questions to " verify" my account which took over 20 minutes. Then he said " It is up to Allure as to what products they send in the future but they are not cancelling the boxes". Again I said I wasn't asking about any cancellation issues. I asked my simple question again. He totally winged it. Said that what we had gotten is what we can expect in the future. CS has not been notified of any changes. I DO think there will be a price increase. They have some boxes on sale from past months ( years), and they are now $18 each. In the meantime, got a rocking Memebox and my 3B box, so I'm chill.